WATCH THE PORTRAITS REVEALED IN REAL-TIME! As each male role model is revealed, a special message from him will be launched! 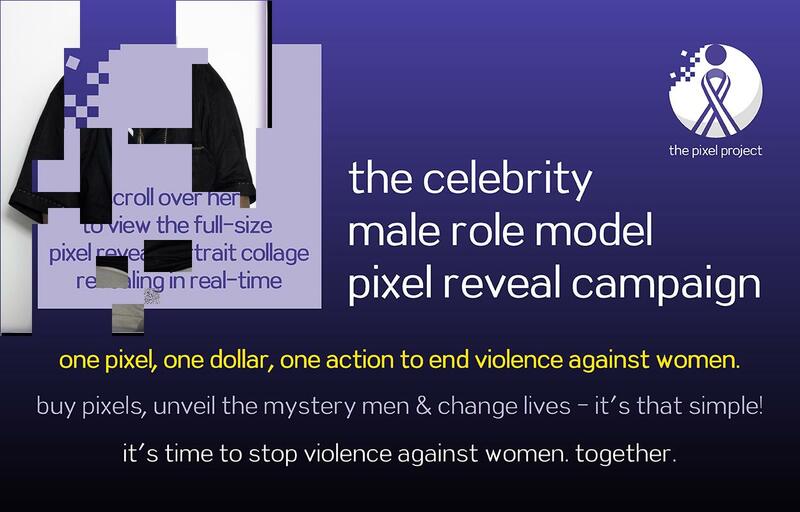 The Celebrity Male Role Model Pixel Reveal campaign is an innovative charity crowdfunding campaign that will raise US$1 million for The Pixel Project to fund their work to stop violence against women (VAW). The campaign showcases the importance of including men in the movement to end VAW by uncovering a 1-million-pixel portrait collage of celebrity male role models helping to inspire the global audience to stop VAW. Every dollar donated reveals 1 pixel of their portraits. Donations start at as little as US$10 (10 pixels). The Pixel Project will be hosting the fifth annual Fall Edition of their “Read For Pixels” campaign. “Read For Pixels” 2018 (Fall Edition) features live Google Hangouts with award-winning bestselling authors in support of the Celebrity Male Role Model Pixel Reveal campaign. Participating authors include Alison Goodman, Brandon Sanderson, David D. Levine, Fonda Lee, Fran Wilde, Jay Kristoff, Jim C. Hines, Julie Czerneda, Juliet E. McKenna, Kate Elliott, Martha Wells, Marie Brennan, Richard K. Morgan, Sarah Beth Durst, and Tananarive Due. Want to keep up with Pixel Project news?